Prayerless wonder • Run Hard. Rest Well. I am a prayerless wonder. I have learned of yet another Kingdom worker who spends hours (HOURS) on his knees before entering his day. And it shows – in his heart, his hope, his vision, his fruit. In the arena of prayer, God and I share a casual closeness. He’s never far. I keep Him in my line of vision. (More importantly, He keeps me in His.) I dive deeply into His Word each morning. It’s the highlight of my day. But my prayer time is lacking. It’s OK. But I want more. And so does He. I want to learn how to pray like Jesus. 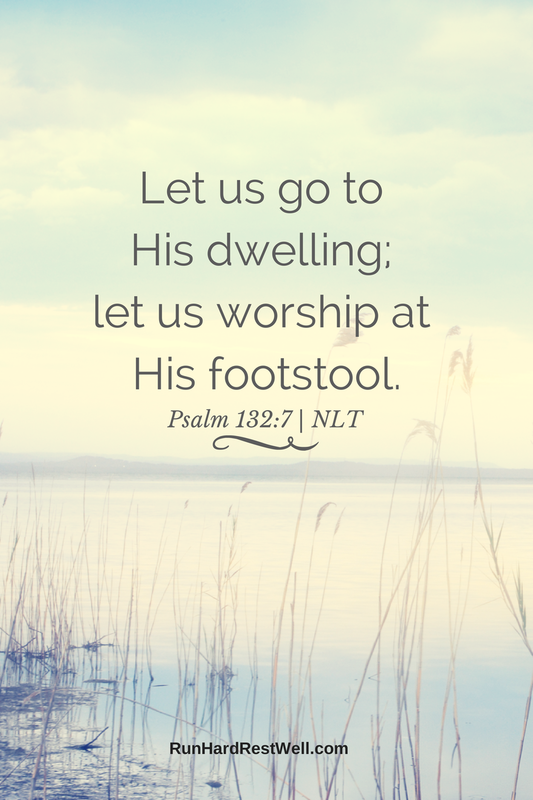 Let us go to His dwelling; let us worship at His footstool. Mary sat at Jesus feet. What did she do there? She listened. Focused and undistracted. Jesus, teach me to listen, so I may be praying for the things on Your heart. When was the first time you asked the Lord to teach you to pray? When was the most recent? Let’s hold hands and dive in together! This is a great reminder. Okay, Betty, get out of the boat and start walking on the water. Keep your eyes on Jesus and not the storm. I am with you always. I am so busy I can’t sit still long enoigh for a conversation. And when I do, I’m so focused on accomplishing that I turn the prayers into a “to do” list for God. How easily I corrupt something so precious! But Monday was different! Monday was just being together! Like Lovers on a date, I was just admiring Him, just enjoying His presence, just relishing His thoughts about me, his thoughts about everything. I will search for the one my heart loves! Oh the intimate communion. Oh the life-line. LIFE-line! Through Him, The Holy of Holies is ours. But the distractions. the demands. Thanking the Lord for Monday’s sweet embrace with Him, the praise, the filling, the rest. Thank you for sharing the “battle cry” — I will search for the one my heart loves and for the promise that is unshakable…morning brings word of his unfailing love. From around the world, may our knees bend, our hearts be filled, our souls find rest … for the race we’re called run. Praying for the mountain moving work before us all … and you and Ivy very, very specifically this week! Today’s task at work, move dinnerware. My cart full of 12 16 piece place settings and some various open sell pieces; all stoneware. Like most businesses, we are cutting back. Help is near, but at the cost of putting someone else behind. “Think again, Erin” Help is here, inside. “Lord, help me push this cart way over yonder.” I push greatly as my feet slide across the smooth floor. The cart is moving, moving along. I come to the place where the cart is to rest, wipe my forehead; “thank you, Lord!” In my head where I contemplate, “faith like a mustard seed. If I have enough, the cart will move with just one hand.” I touch the cart, it doesn’t move. Again I gently touch, it stands firm. I stop. I listen, not to the loud voice rattling in my head, but to my heart. “The journey is finished. The Lord walked with me. He walked right next me, as He always does. So what am I trying to prove? The Lord walked with me, Praise Him. I ask for guidance with prayer every day, in this tipsy world I reside in, it seems I am praying for all the residents of the planet I was set upon. Are my prayers to general, lacking in emotion, overrun with sentiment? When I am lost, I start with “Our Father”. And when I don’t know what to say, I repeat to Lord my God how much I truly love him. My worries are like a cucumber on the vine; good fruit, gentle prickles. “Lord look inside, You know what I don’t know what to say. Gently brush away my prickles, when the time is right harvest me and bring me home. My heart is with you, my friend. I, too, try to be the mustard tree when, in fact, I am but the seed. The seed grows into the tree, but it is not the tree. I have to keep remembering that. I am a source. But unless I am firmly planted in Jesus, nothing comes of that which is inside of me. Your questions on prayer. God knows our hearts. They are deep. So often there are no words. How can their be? Jesus merely asks us to come to Him. He bursts forth and provides the fruit and the shelter, the rest and the peace. Peace….glorious. He is making you strong, Erin. He is growing you in Him. There is nothing more nor anything better you could ever ask. His Spirit prays through you….it is enough. Yes, the days are growing close when Jesus will carry us home. I’m ready. My life must be a continual conversation with the One I love. Sometime words fail me, but my heart rises us. This is what you do….and oh, so many others of Chist’s beloved army. You two bless us again and again. Thanking God for you, your love, your passion, your joy, your honestly, your hope — in stereo! You offer us Truth and Love. Thank you…from all of us!